We’ve put together a brand new album of brain wave music for those of you who want to be able to “dial in” a desired mental state whenever you’d like – and you can do that with our specially engineered MP3s that include binaural beats and isochronic tones in each of the four major brain wave categories. If you’ve found your way to this page, you might already know about brain wave “states” – the electrical activity associated with mental processes such as cognition, creativity, meditation and sleep. And you may also be aware that you can guide your mind into each of these states with the right kind of music – which is what we’ve made available for you in this album. We’ve been making brain wave audio programs available on the Internet for the last several years – and have over 4.5 million YouTube viewers that attest to our popularity! Depending on “where you are at” during the day, you can listen to one of the corresponding tracks and feel your mind “get in the groove” of where you want to be, just by putting on headphones or earbuds and listening to the pleasant ambient music, combined with the binaural beats and isochronic tones professionally mixed in every track. Ouch! Obviously, it was a little over my skill level as well, but I was motivated, to say the least, and I had my own secret weapon – Beta Brain Wave Music – so I put the headphones on and did my best to concentrate and learn something (back-end .php coding) that I had never done before! Less than an hour later, I had fixed a problem that the tech people at the Big Web Hosting Company couldn’t – and I was pretty happy, mostly because this website was back up and running normally, and also, because I believe that brain wave music can be effective – when I have the luxury of being “dreamy,” I listen to Alpha Brain Wave Music, if I want to meditate deeply, then I switch over to Theta Brain Wave Music – and if I want to go to sleep, I put the iPod in the speaker dock near my bed and put the Delta Brain Wave Music playlist on repeat. You get the idea. So not only will you have immediate access to the Brain Wave Music tracks in this playlist – you will also be able to download the other elements of our music collection (Alpha, Beta, Theta and Delta), plus all of our Hypnosis, Deep Sleep Programming and Affirmations tracks as well! 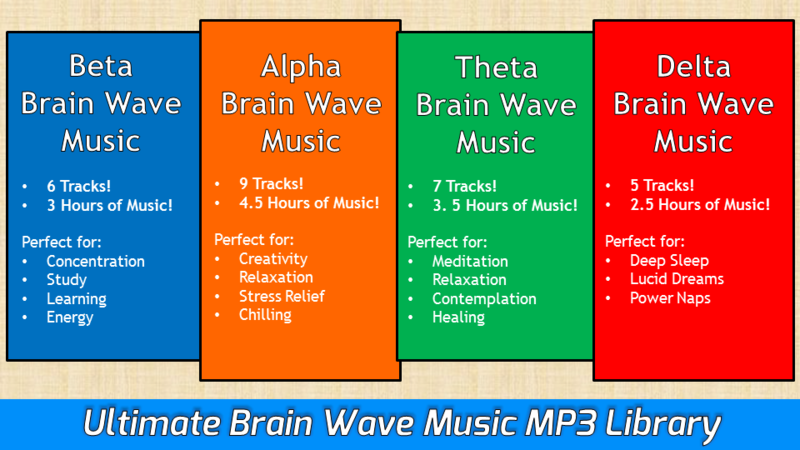 Order The Ultimate Brain Wave Music MP3 Library now! ,or scroll down to review the list of Ultimate Brain Wave Music MP3 Library titles, or just go ahead and give yourself membership to the complete Brain Garage MP3 Library of over 500 tracks!